Conventional wisdom says that guards and offensive tackles are the most under-appreciated positions in football. The big guys blocking other 280-300 pound men so the running backs and quarterbacks can look good certainly don’t get enough credit. However, there’s a component of the football program that gets even less time in the spotlight, and make everyone, including the offensive line, look good. And that’s the equipment managers. When he’s not having his heart broken by his beloved Buffalo Bills and Sabres, Kyle Chadwick ’17 can usually be found preparing for game day at the Tribe’s facilities, patrolling the sidelines alongside head coach Jimmye Laycock ’70 during game day, getting the team neat and organized for another week of practice, or typing away late at night providing his own insight and analysis on Tribe sports on his own William and Mary Sports Blog. Chadwick is the green and gold-standard of William and Mary fans, taking the trip to the Colonial Athletic Association championship basketball tournament in Baltimore, and checking out the 2014 season-opener in Blacksburg, Va. After celebrating the NC State victory last week, I had a chance to talk with Chadwick about his job as a Tribe football equipment manager. Chadwick described how he got involved as an equipment manager. Chadwick worked as a marketing intern for Tribe Athletics during his sophomore year, but he had aspirations to work for the football. During the spring 2015 semester he saw an opening for the equipment manager position. Chadwick explained what an average day looks like as an equipment manager. Since he works most of the week and goes to most of the games, his busy schedule occupies most of his afternoons during the season. Chadwick said the job is everything he expected despite some long, tedious days. He also said one of the biggest unexpected perks of the position was new friendships. While on the sidelines, Chadwick holds many roles, including game manager, water boy, as well as offensive and defensive bench aid. Though sideline traditions in game preparation sometimes boarder on the superstitious side in football, Chadwick hasn’t seen any Tribe equivalent of the Virginia Tech lunch pail or Bible verse eye black. Though Chadwick has seen every game this season in his role as equipment manager, his favorite game and favorite play of the season were both from the College’s biggest win of 2015. The go-ahead score of the James Madison win should sound familiar to Tribe fans. Chadwick discussed working with Laycock, the longest-tenured Division 1 football coach. 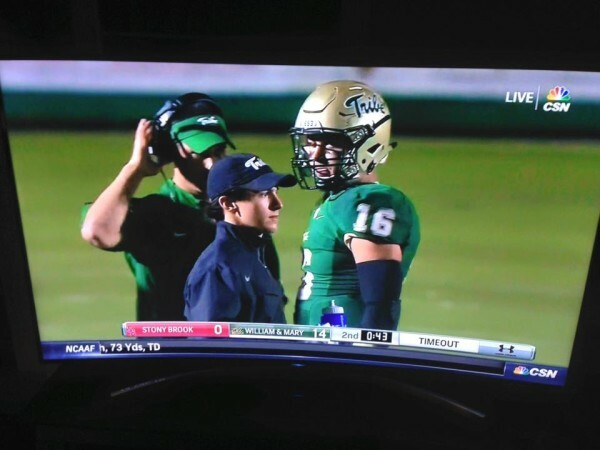 In addition to working as an equipment manager, Chadwick and his brother Davey Chadwick ’15 run the William and Mary Sports Blog. Chadwick is current enrolled in the Mason School of Business and says he will likely do something corresponding with his degree, rather than sports reporting, but says he will always be a Tribe fan and will continue the blog after graduation. Flat Hat Sports Editor Sumner Higginbotham '16 is an accounting major from Altavista, Va.